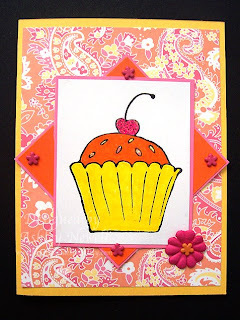 Here's the card I did for Taylor's cupcake challenge last week. I was inspired by the designer paper. I just love the yellow, pink, and orange color scheme. I got this image in a swap so if you know what it is, please inform me. I have no idea. I just know that it's cute and I just love the size of it. That paper looks so much like vera bradley's hope toile fabric or sherbet! Do you own one of those bags? The card is very cute!!! Love the cupcake...hey, I thought you were doing REAL work today? LOL! This is too darn sweet! I love the fun colors! This is so cute Ashley - I love that paper too - funny how one piece of paper can inspire an entire card! That was a really cute announcement you made - wish I had someone to make dots for me!! Lucky girl! !